Regan Campbell, FFG(X) program manager at the Naval Sea Systems Command, has said the U.S. Navy plans to award four to six contracts by March to advance work on the conceptual design of the future guided-missile frigate as the service prepares to award the final construction contract by 2020, USNI News reported Tuesday. The military branch has begun reviewing the conceptual designs submitted by companies in response to a request for proposals released in 2017 for the FFG(X) program that seeks to procure a total of 20 ships. “We’re going to have a technical review of each of these proposals by the end and provide them feedback in where these designs might need some buffing up to get to a full and open competition,” Campbell said Tuesday at the Surface Navy Association 2018 symposium. “You will see those requests for proposals by the fourth quarter of 2019, with an award in 2020,” he added. Breaking Defense also reported that the Navy has set a maximum average price of $950 million per hull for the second ship through the 20th frigate. Campbell noted that the first ship in the program is expected to cost more than the estimated average price per hull. The Navy will provide the government furnished equipment that includes the COMBATSS-21 combat management system, standard radars and Mark 41 Vertical Launch Systems. 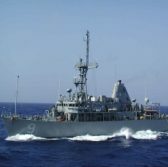 Campbell said the Navy will require each frigate to have eight launchers to field anti-ship, over-the-horizon missiles and a minimum of 16 VLS cells with an objective number of 32 cells. Under the program, the service intends to buy the first ship in 2020 to be followed by the second frigate in 2021 and the remaining ships at an annual rate of two vessels by 2022, the report added.